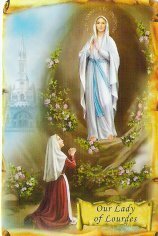 Lourdes apparitions of Our Lady began in 1858, when a 14-year old peasant girl from Lourdes called Bernadette, was visited 18 times by the Blessed Virgin Mary. Bernadette told her mother about the enchanted first vision and how wonderful it was to such a beautiful lady. Bernadette's Mother questioned her in disbelief, Bernadette answered her mothers question by saying I have seen a "lady" in the cave of Massabielle. The Cachot where the Soubirous family lived was cold and without firewood. At about 11 o'clock Bernadette and her sister Toinette and her friend Jeanne Abadie went to gather firewood around the Massabielle. 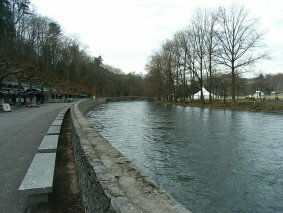 Having arrived at the mill, instead of going on into the woods, they came to a river and realized they could go no further, Bernadette's sister and friend prepared to cross the water, soon Bernadette was alone on the other side, so Bernadette decided to try and cross the water without taking her stockings off, this was not possible and she returned back to the Grotto and started taking her stockings off. Bernadette heard a noise and looked towards the Grotto. Bernadette raised her head to look at the grotto again, after hearing the noise for a second time, she saw a lady dressed in white with a blue sash and a yellow roses on each foot. Bernadette took out her rosary and wanted to make the sign of the cross, but was unable to her, hand trembled. The lady she was seeing made the sign of the cross and the second time Bernadette manage to repeat the same actions of the lady who was dressed in white. Bernadette recited the the rosary and then the lady disappeared. The apparition took place between midday and 2pm. Bernadette asked the lady to remain if she came from God and sprinkled holy water on her, she collected the holy water from the parish, the lady replied with a smile. 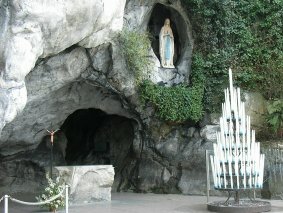 Bernadette was immobile, and her eyes fixed on the grotto started to say her rosary. Due to Bernadette being immobile she was carried back to the mill where she regained full consciousness, and was scorned by her mother "NEVER TO RETURN AGAIN"
About 800 people were present and Bernadette repeats the acts of penitence and takes up her usual position. The Madonna spoke to Bernadette and commanded her to "Go, tell the priests to come here in procession and tell them to build a chapel here." Bernadette went straight to to ask Fr. Peyramale which this wonderful new, Fr. Peyramale called Bernadette a liar and told her she must never return to the grotto, then he told her to leave. Bernadette was did not give up home and returned once again with one of the priests friends and repeated what the lady had told her, "Go, tell the priests to come here in procession and tell them to build a chapel here." Fr. Peyramale says "a chapel! a procession! poor child this is all what your stories needed" then in a sharp tone he says" ask this lady her name and when we know it we will build a sanctuary". Eight thousand people turned up for the 15th apparition. for the 3rd time Bernadette went to see M. le Cur?, to tell him what the Lady had ordered "Go, tell the priests to come here in procession and tell them to build a chapel here." M. le Cur? looked at Bernadette for a moment, and said to her, 'Who is this lady?' Bernadette did not know who this Lady was. The commissioned ordered Bernadette to find out this Lady's name and only to return with an answer. Bernadette asked the lady for her name again, the lady smiled once more. On the 16th Bernadette announced the lady's name. Bernadette said "I went for a fortnight and every day I asked the lady who she was, but these questions only made her smile". When Bernadette found out the Lady's name, the lady said 'I am the Immaculate Conception.' She was asked by an onlooker "are you I absolutely certain". Bernadette replied "yes". The town physician Dr. Pierre Romaine Dozous, watched the apparitions from a skeptical point of view. He believed Bernadette, and knew her to be genuine and not a person to make up wild stories. He place all the evidence together and decided to write a medical article explaining that one can have illusions or hallucinations without being insane and that Bernadette was not insane. The apparition took place between Bernadette and the Virgin Mary about 5 0'clock in the morning with no conversation at all and it was reported that "Bernadette seemed to be even deeper, than usual trance. This was witnessed by hundreds of people.This is when the "miracle of the candle" happened, Bernadette was kneeling and saying her usual prayers with her Rosary while holding in her left hand, in her right hand was large lit candle. While Bernadette was saying her prayers she suddenly stopped, and joined her right hand with her left hand, their a flame from the big candle passed between Bernadette's fingers followed by a strong breeze. The flame from the touching candle made no marks on Bernadette's skin. After 15 minutes Bernadette, made way to the upper part of the grotto. When Bernadette and the apparition finished Dr. Pierre Romaine Dozous asked Bernadette to show her left hand for examination, their was no trace of burning marks an her hands. I then asked the person who was holding the candle to light it again and passe me the candle. Dr. Pierre Romaine Dozous reacted the candle burning under Bernadette's hand but she drew her hand away, saying 'You are burning me!'. This was confirmed by hundreds of eye witnesses. Public access was denied on he 8th June in 1858, visitors were fined and guards protected grotto. The grotto was still barricaded. Bernadette had to take another road to enter the grotto from the other side of the river. In front of the barricaded grotto is a private property. Kneeling outside the fence by the riverbank Bernadette said "I thought I was at the Grotto, like I saw the other times. All I saw was Our Lady , She was more beautiful than ever." the immaculate conception said noting and Bernadette never saw her again. The grotto reopens to the public in October of 1858, ordered by the Emperor Louis Napoleon III.